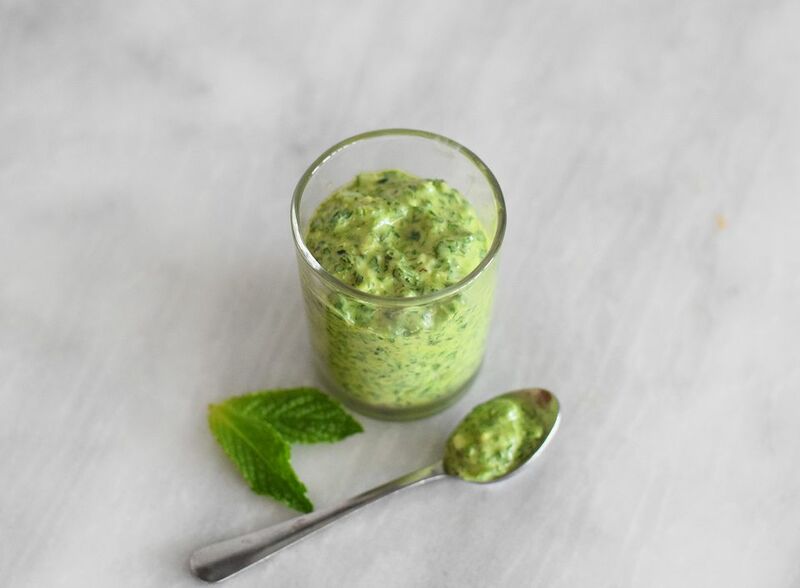 Whether you're looking for an adventurous new way to prepare your everyday pasta dinner, or trying a new method for making your Easter lamb, we recommend trying out this mint pesto instead. Its bright and garlicky flavor complements many dishes, especially those with a little bit of a gamier meat. Want to customize your mint pesto? Feel free to switch out the parsley with spinach to make a mint and spinach pesto. Since parsley is on the milder side, it compliments the mint well. We wouldn't recommend combining two strong flavored herbs like basil and mint, as they may overpower one another. Feel free to leave out the almonds if you are allergic to tree nuts. If you are not allergic to nuts, but aren't a fan of almonds, you can also absolutely replace them with pine nuts. You can also leave out the feta cheese if you are looking to make this recipe vegan. You may just need to add a little more salt, but otherwise the sauce will be very similar. You can also switch up the feta cheese for another crumbly goat cheese. The choice is yours! Make sure to wash and dry the parsley and mint leaves well. Add them to a blender or food processor. Add the garlic cloves, lemon juice, feta cheese, and if you are adding them, the almonds. Start processing (use the pulse feature if available) and drizzle in the olive oil through the top access point as it is blending. Once it is completely combined and finely minced, add salt and pepper to taste. Allow the pesto to sit for at least 10 minutes before serving. This allows the flavors to blend. You can store the pesto in the refrigerator for one week. You can also freeze the pesto in ice cube trays or plastic bags. Just defrost before you are ready to serve. If you are freezing them in an ice cube tray, transfer them to an airtight plastic bag right after they have frozen. They stay fresh in the freezer for months! This recipe is also a delicious herb blend to add to ground beef for some delicious greek meatballs, especially if you have some left over and you're not sure how to serve it. Just add 1/2 cup of breadcrumbs, an egg, and 2 tablespoons of the pesto to a pound of ground beef. Roll the mixture up into meatballs and bake them at 350 F for 20 minutes. You can also serve it slathered on freshly roasted potatoes. It also makes for a super unique and different pasta sauce. Add feta, grilled chicken, and tomatoes to the pasta too for a complete meal!